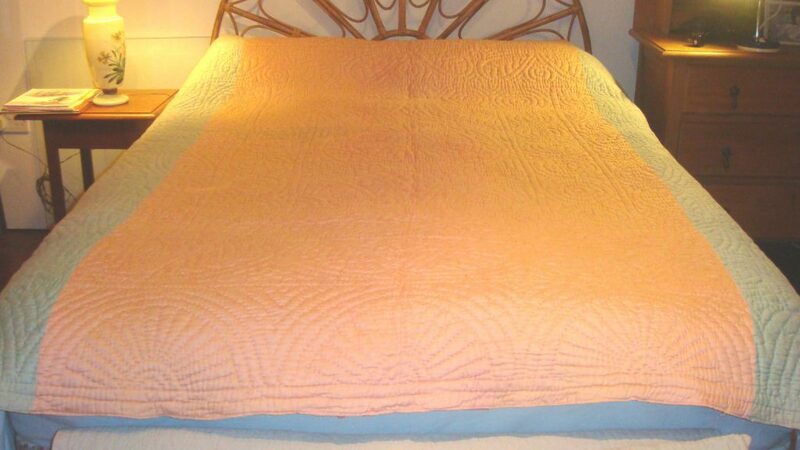 This quilt has the popular “Strippy quilt” format of alternating lengths of two colours of fabric, machine stitched together before being hand-quilted. 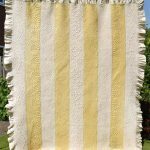 At first glance, it might be thought to be from the North east of England, where many such quilts were made – but closer inspection of the quilting designs reveals it to be Welsh. 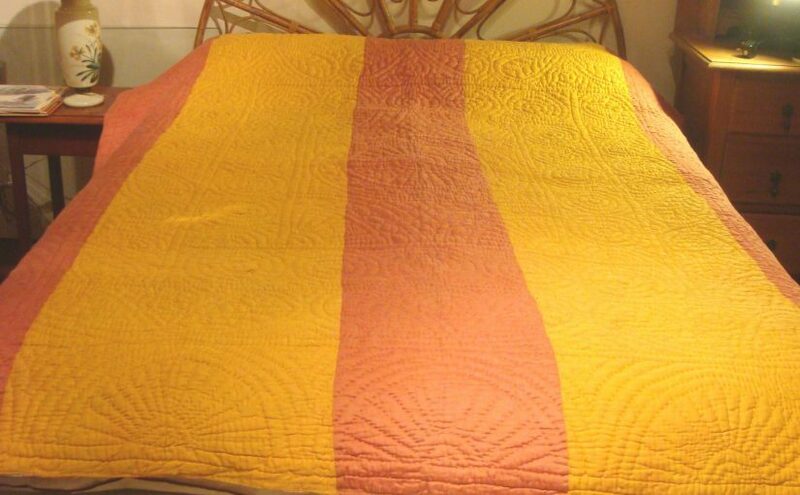 Whereas North Country strippy quilts always have designs such as cables, twists or feathers which run along each strip, this quilt has a quilting design more similar to that on a Welsh wholecloth quilt, with a central “coin” and borders stitched over the entire quilt surface with no regard to the placing of the fabric strips at all. This habit is found on many Welsh patchworks. 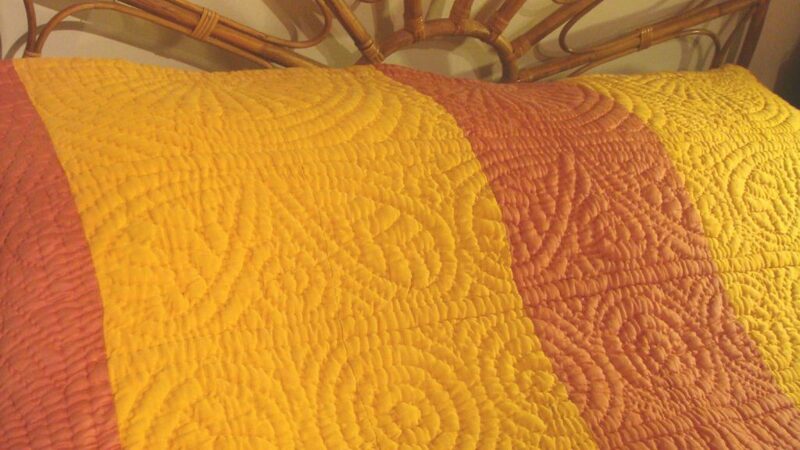 Bought via EBay from a dealer in Cardiff (who wrongly described it as a ‘Victorian, Durham quilt’), this quilt probably dates from the 1920’s or 30’s, when bright, contrasting colours of satin cotton which would be generally considered rather eye-popping nowadays were very popular with quilters. 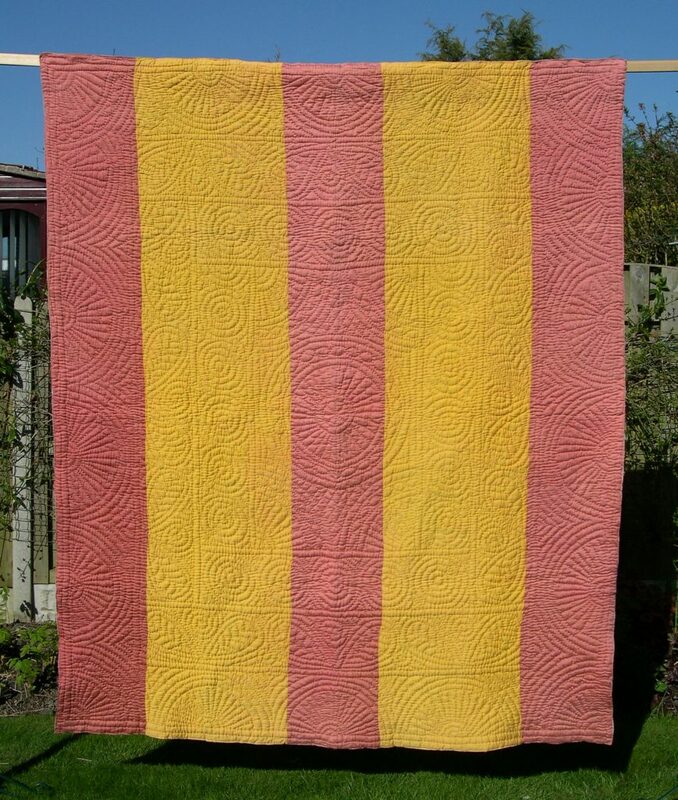 One side has five strips, alternating between old gold and deep rose pink, while the other side is mainly salmon pink with two side borders of what must originally have been a strong turquoise, which has now faded to a softer blue. 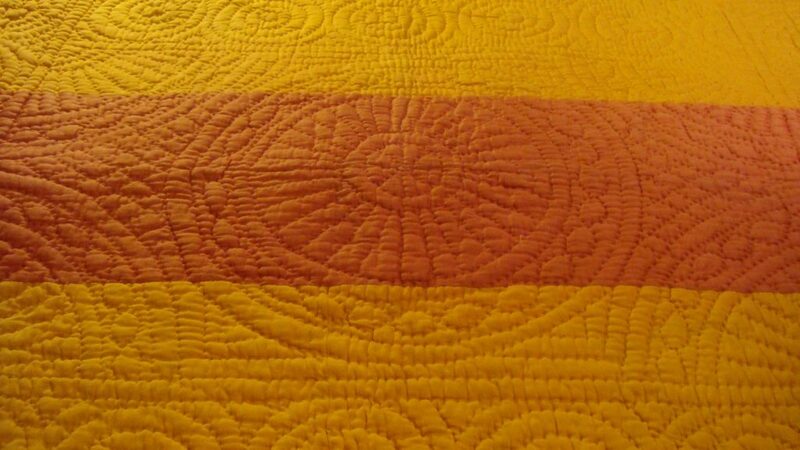 The quilting design of the central “coin” has radiating spokes surrounded by a simple cable within a double lined circumference. A quarter circle of this design appears again nearby as fan corners, and half circles of the same pattern again are found all around the final wide border. The stitching is fairly coarse, partly due to the impossibility of fine stitching through the thick wadding – I thought this was cotton as it is dense and fairly solid to the feel – but I managed to pull out a few strands from between the edge, and it is possibly kapok. 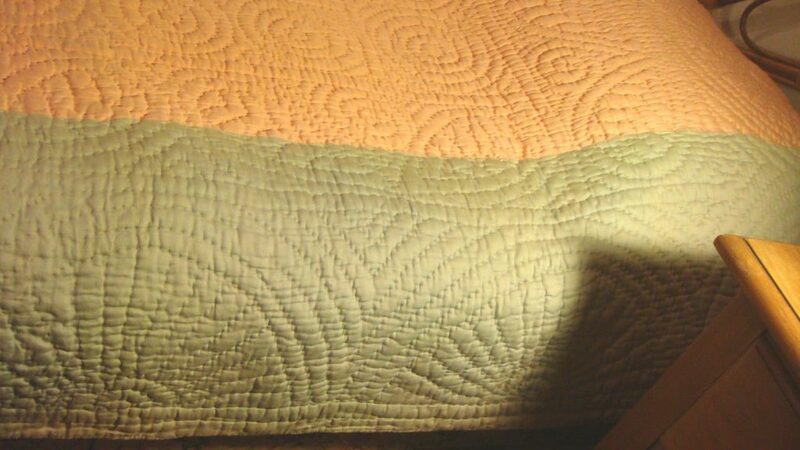 The butted edge is finished with a line of machine stitching.